Product #60671 | SKU WLC-T03-BC | 0.0 (no ratings yet) Thanks for your rating! This charger can charge one to four IMR/Li-ion batteries simultaneously via wall AC power, 12V car power, or 5V USB power. This smart Tilta Nucleus-M Battery Charger can charge one to four IMR/Li-ion batteries simultaneously via wall AC power, 12V car power, or 5V USB power. 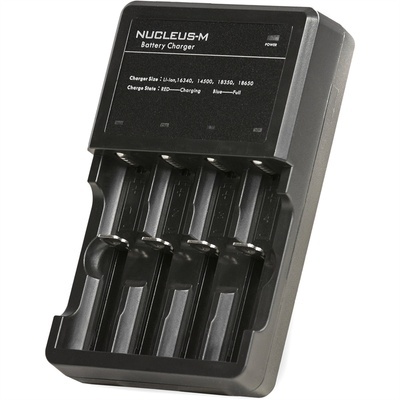 It comes with the Nucleus-M kit and is used to charge the 18650 batteries that are required to power the Nucleus-M’s hand unit and handles. Aside from 18650 batteries, the charger can also charge 26650, 22650, 18490, 17670, 17500, 10400, 16340, 14500, 18350, (RCR123) and Ni-MH/Ni-Cd: AA, AAA, AAAA, C batteries. Above each battery compartment are LED indicators. The LEDs indicate the amount of charge: a solid blue LED bar over the battery indicates a full charge while a red LED indicate a still charging battery. The battery slots are spring loaded for optimum fit.